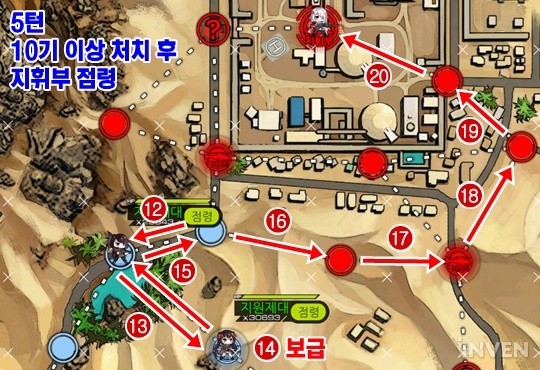 Area 6 is once again considerably more difficult than previous area, so 5x links are recommended for your dolls. There will be increased numbers of battles for each echelon therefore more pressure to tanker’s health. 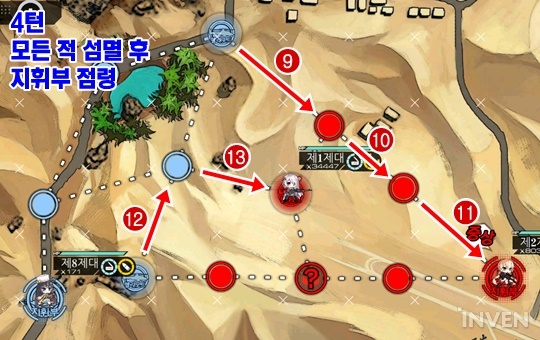 Remember to kite efficiently and effectively. 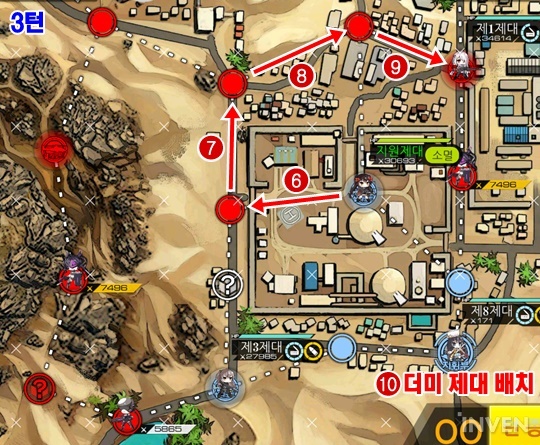 One good thing about area 6 is that there is now ample movement points and turns to achieve S rank compared to previous area. 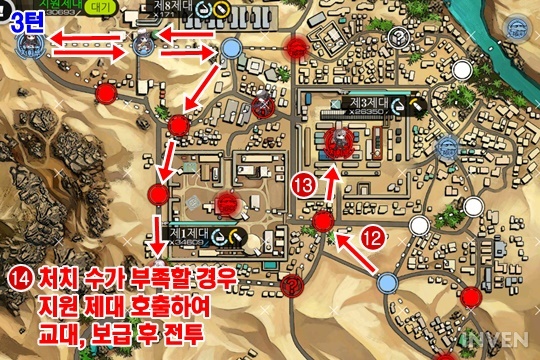 On top of that enemy movements became more predictable. 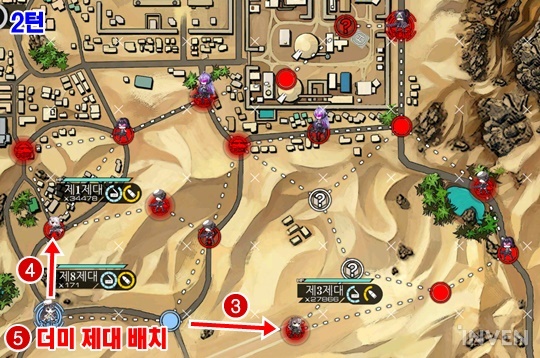 One thing to keep in mind in area 6 is securing resupply route using dummy echelons and friend’s echelon. 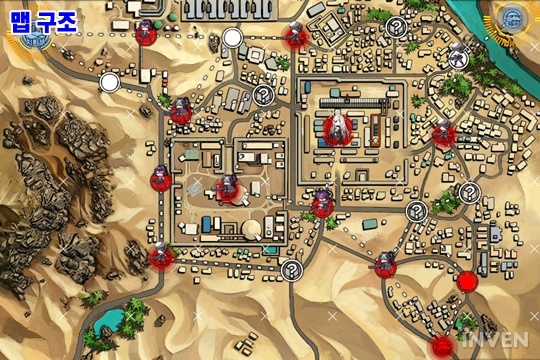 This will become crucial in one map. 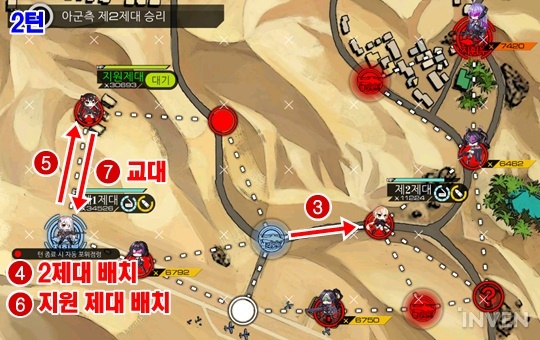 It is important to be flexible in mission due to Girls Frontline does not have fixed enemy movements. So adopt accordingly.I am using pictures with Korean language on them, anything on it will be translated on the bottom of the picture. 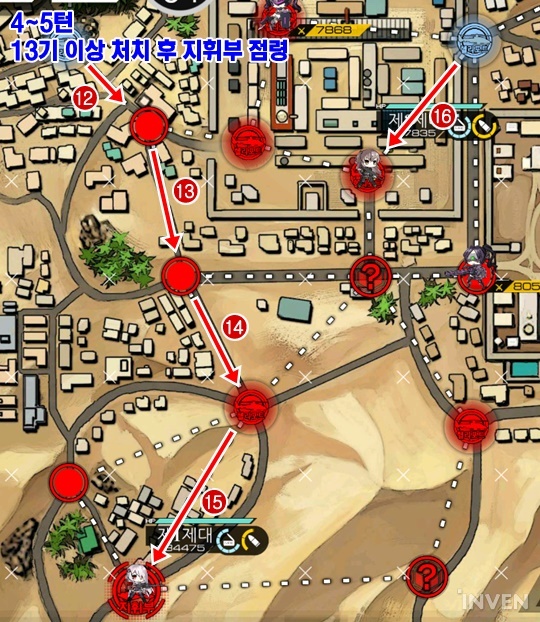 Red numbers indicates movements. Number on top left of the picture indicated what turn it is in. I would like to thank Redin at Inven.co.kr with the image. Without it I would have to spend hours capturing new images. S-Rank condition: Kill 8 unit in 4 turns; control enemy HQ. Turn 1: move 1st echelon up one and deploy 2nd echelon. 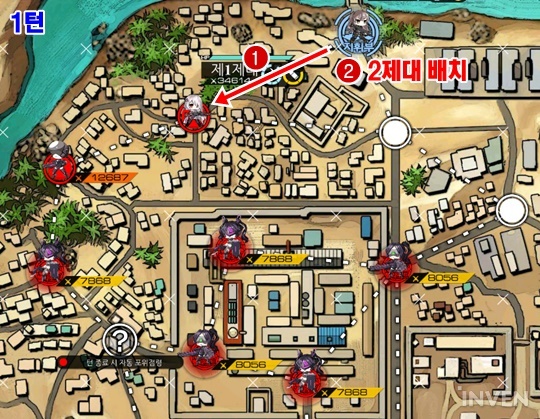 Turn 3: Deploy Dummy Echelon at HQ with remaining MP. 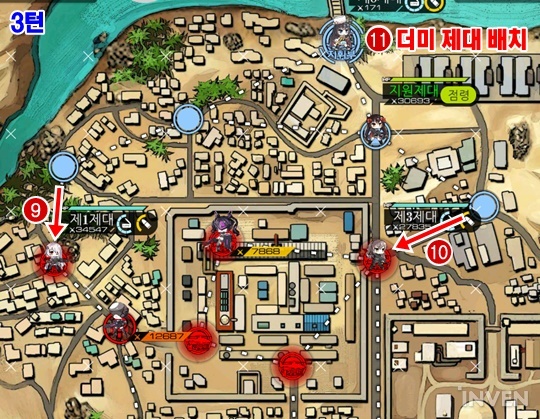 Turn 4: Kill all units and take enemy HQ. Turn 2: Move 1st Echelon right 1. Deploy 2nd Echelon on HQ then move up 1. 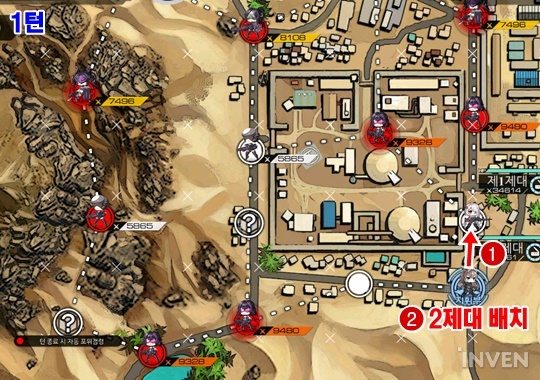 Deploy Friend Echelon on HQ then swap 2nd Echelon back onto HQ node. End turn. 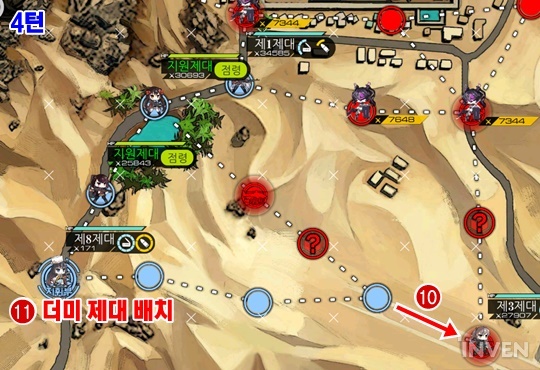 Turn 3~4: Meet Kill all enemy units on the map and take HQ. 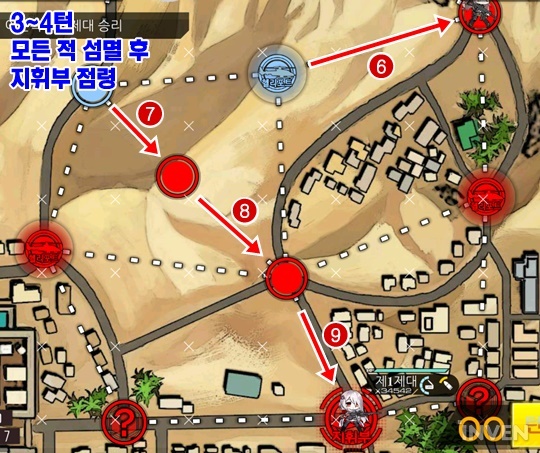 S-Rank condition: Kill 7 unit in 4 turns; control enemy HQ. Turn 1: Move 1st Echelon right 1, then deploy 2nd echelon. End turn. 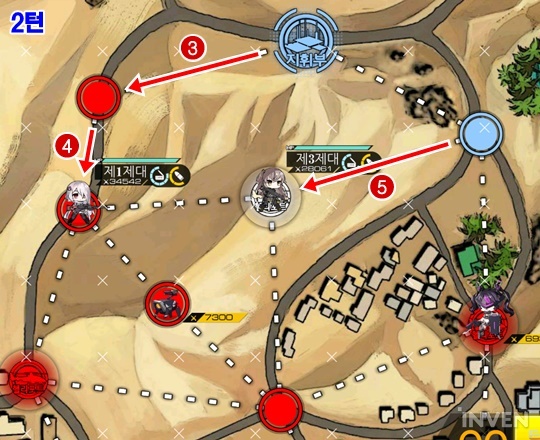 Turn 3~4: Kill all enemy units on the map then take HQ. 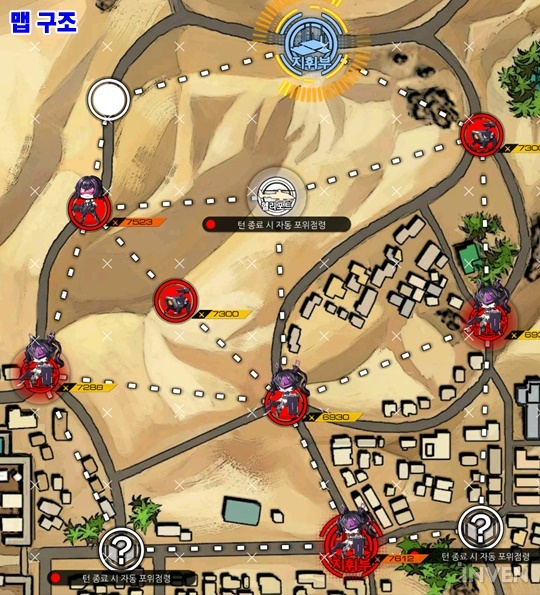 S-Rank condition: Kill 10 unit in 5 turns; control enemy HQ. 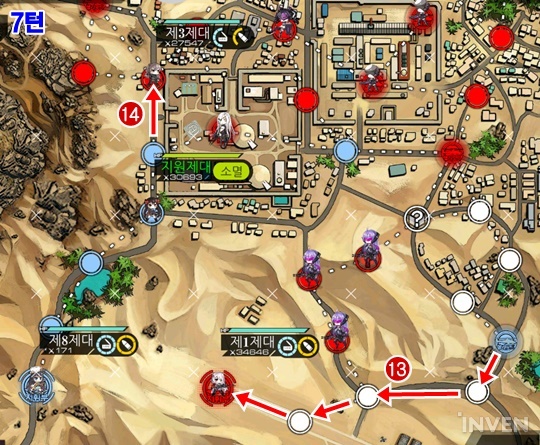 Turn 1: Deploy weaker Echelon first, move to right 1, deploy main Echelon. Turn 2: Move main Echelon up 2, 2nd Echelon right 1, deploy Friend Echelon and set to HQ. 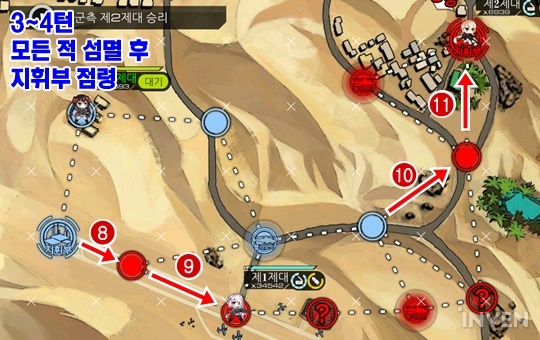 Turn 3: move Each echelon right 1. Deploy another Friend Echelon, also set to HQ. 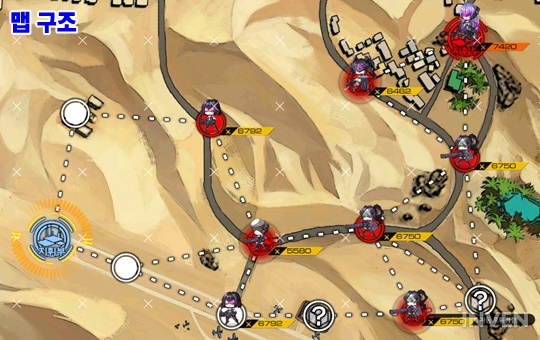 End turn with 1 remaining MP. Turn 4: Move 2nd Echelon down 1 to helipad. Deploy Dummy Echelon at HQ. 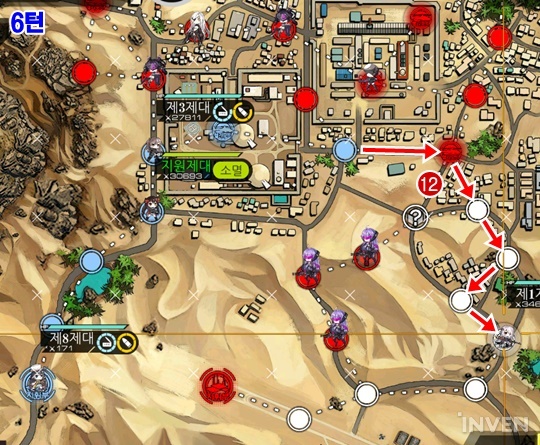 Turn 5: Use Friend Echelons to resupply main Unit that has no ammo using helipad on center bottom via swapping locations. 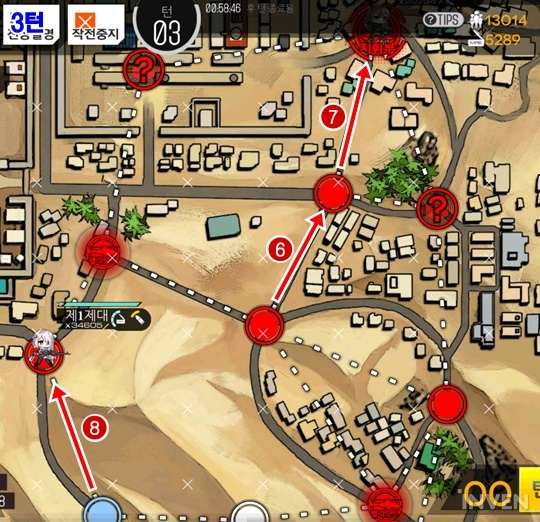 Then go counter clockwise through the map to kill 10 enemy units and take HQ. S-Rank condition: Kill 11 unit in 4 turns; control enemy HQ. 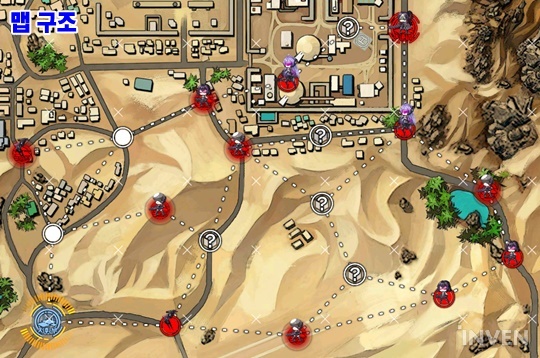 Turn 1: Deploy Main Echelon on HQ, move up 1, then deploy 2nd Echelon on HQ. Turn 2: Take both Helipad on center and bottom center. 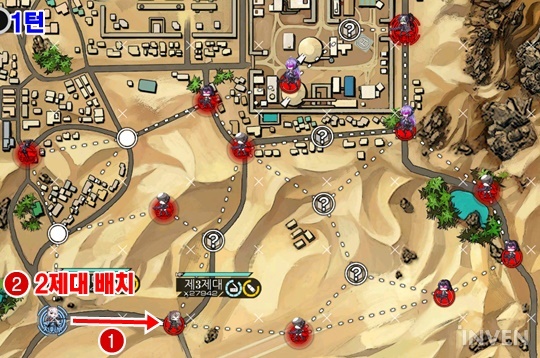 Turn 3: Main Echelon makes Clockwise movement to stop on the top of the enemy helipad. Spawn Dummy echelon on HQ, and Friend echelon on Helipad on center set to “eliminate”. 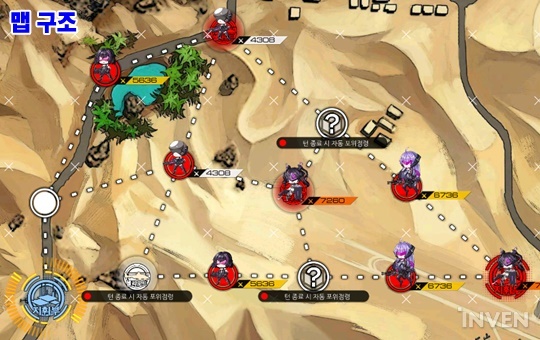 Friend Echelon will protect HQ node. Turn 4: 2nd Echelon resupplies and goes up the left mountain route to take HQ. You should have 11 kills at this point. 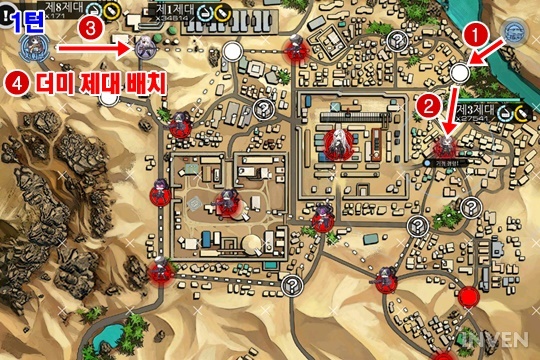 Required Squads: 2 (20,000+ & 17,000+ recommended) + 1 Dummy Echelon. Map View. 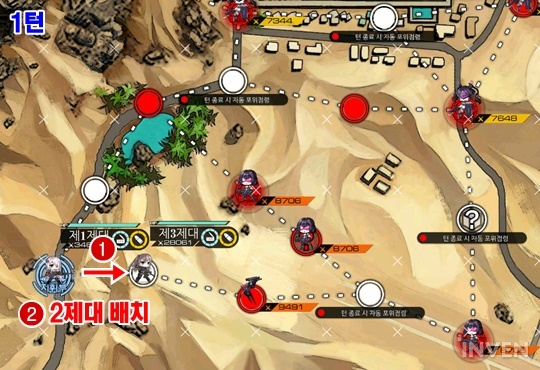 Unfortunately Boss fight cannot be avoided in this battle, so maintaining good tanker hp on main Echelon is recommended. 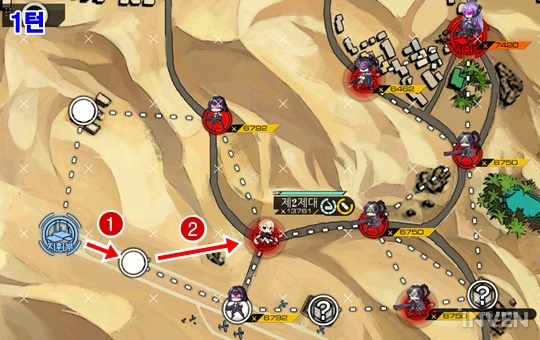 If your squad can deal a large amount of damage in short period of time, there’s a potential way to skip annoying boss skill. More to be covered in the future. 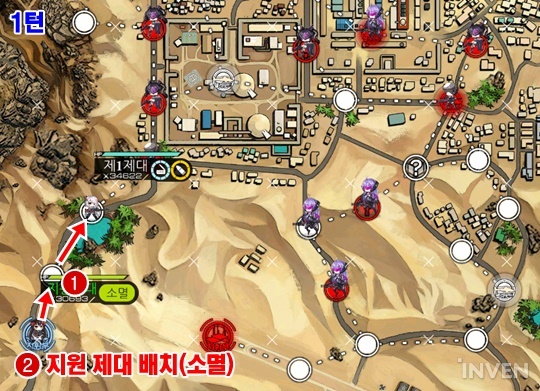 Start: Deploy Boss kill Echelon to helipad on top right and 2nd Echelon on HQ. Turn 1: Boss kill Echelon moves down 2 to take Helipad. Move 2nd Echelon right 1, then deploy Dummy Echelon. Turn 3: Boss kill squad goes to kill the boss. 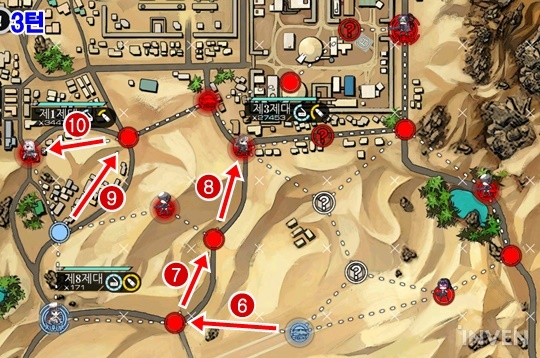 If kill requirement is not met, use 2nd Echelon to kill additional enemy units on the map. [reference above]. 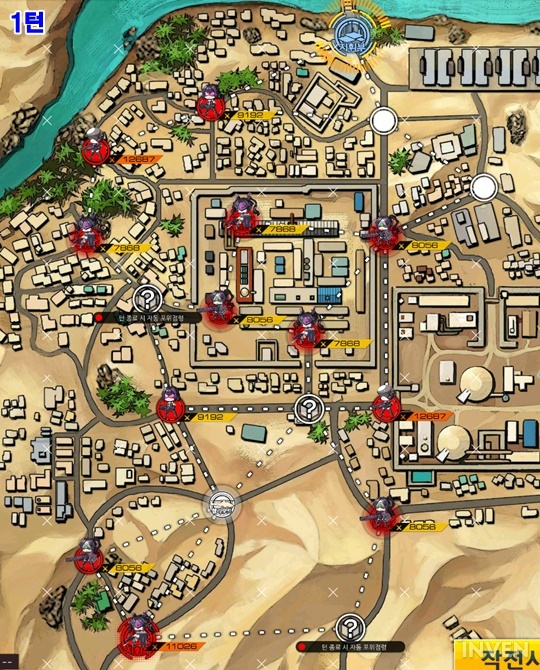 If need be, spawn Friend echelon to resupply once more through HQ. S-Rank condition: Kill 8 unit in 3 turns; control enemy HQ. Turn 1: Deploy main Echelon, move up 1, then deploy 2nd echelon. 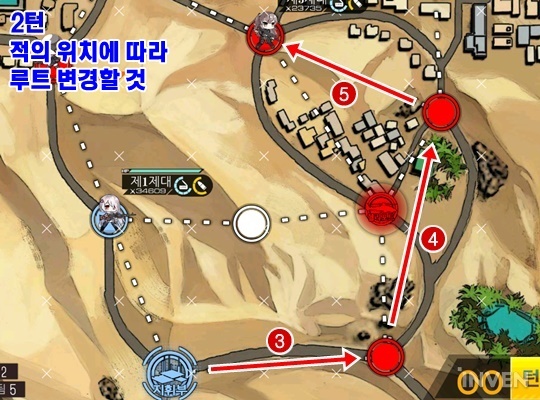 Turn 2: 2nd Echelon moves along the route with enemies [can be different from shown above] but still ending at same point in the center. Turn 3: Move main Echelon up 1, 2nd echelon moves to take HQ. 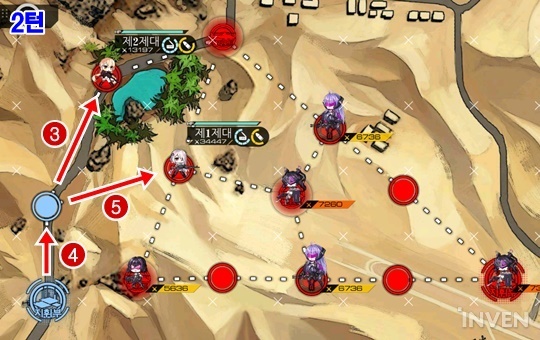 S-Rank condition: Kill 13 unit in 5 turns; control enemy HQ. 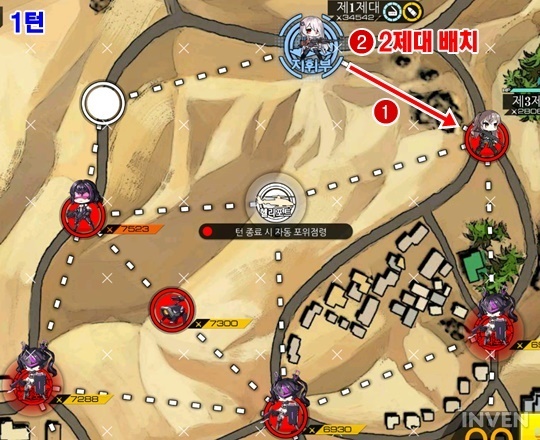 Turn 1: Move main Echelon left 1, spawn 2nd Echelon. 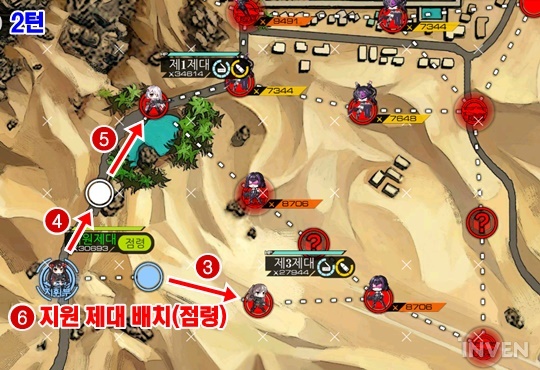 Turn 2: Swap Main Echelon with 2nd Echelon on HQ to resupply. 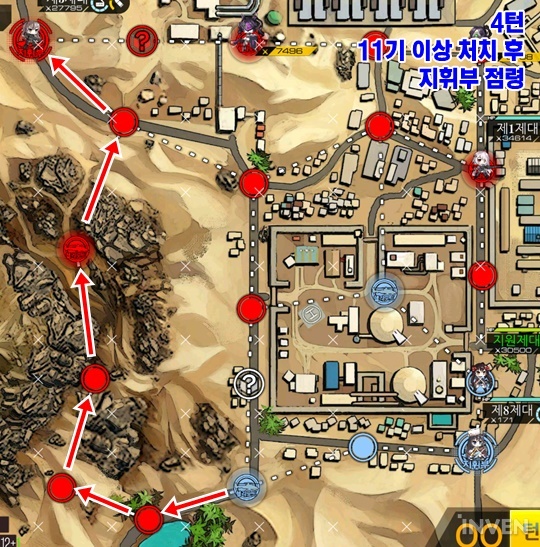 Then swap back to original location. Move left 1. 2 Echelon moves down 2 to right. Spawn Friend Echelon, set to HQ. Turn 3: both Echelon moves 1 to take Helipad. Spawn Dummy Echelon on HQ. Turn 4~5: Main Echelon resupplies then moves down to take enemy HQ. 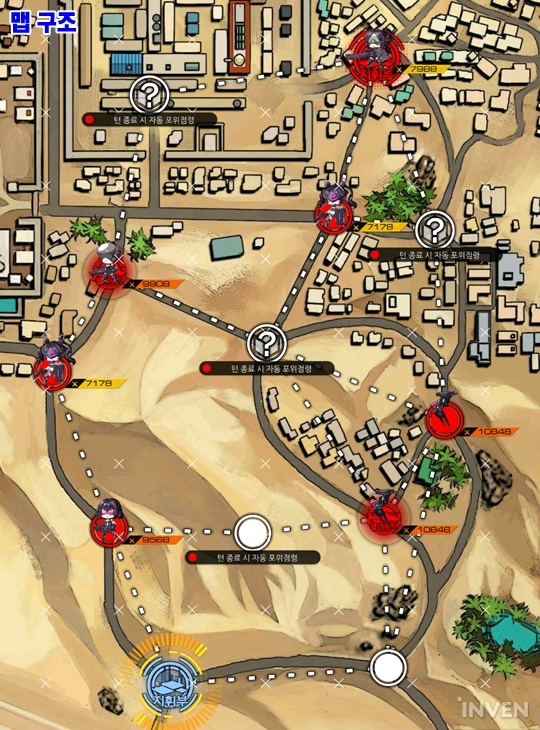 2nd Echelon kills unit near it to fill 13 kill Requirement. S-Rank condition: Kill 12 unit in 4 turns; control enemy HQ. 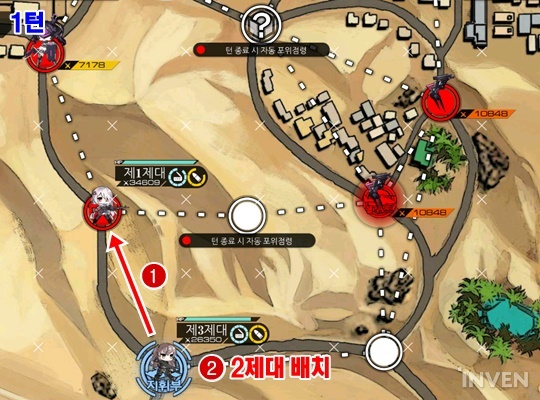 Turn 1: Move Main Echelon right 1, then spawn 2nd Echelon. 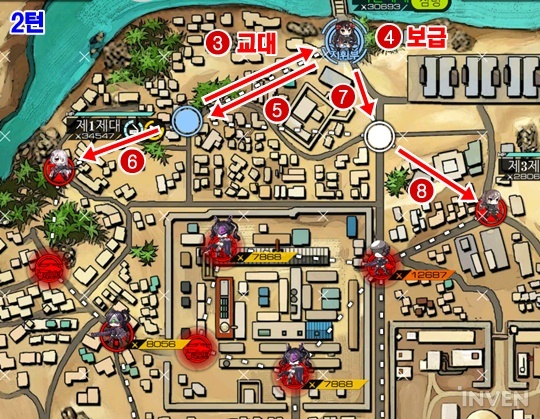 Turn 2:Move main Echelon right 1, 2nd echelon up 1, spawn Dummy Echelon at HQ. 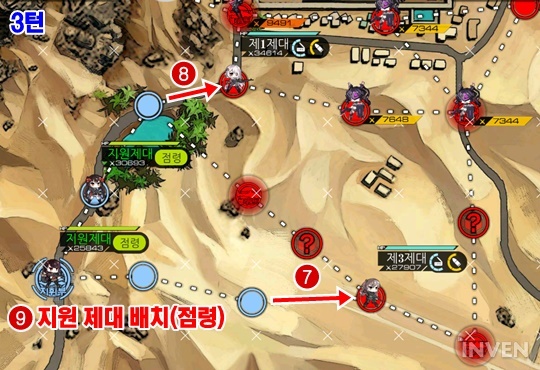 Turn 4: Meet 12 kill Requirement and use Main Echelon to take enemy HQ [13~15]. 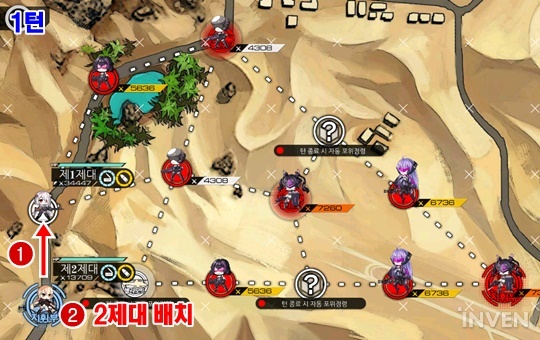 S-Rank condition: Kill 14 unit in 7 turns; control enemy HQ. Map View. There’s…. 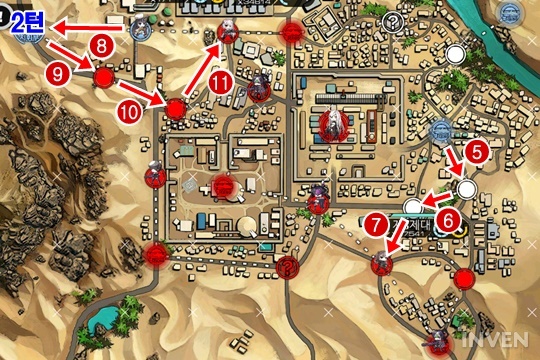 LOTS of bosses… and what is CP with those walkers?!! Don’t worry, you don’t have to fight any of these OP units. 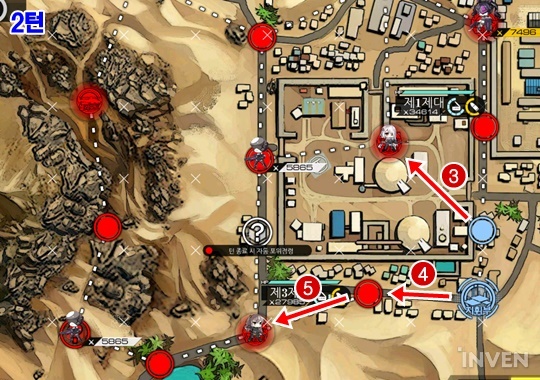 Remember to be flexible with your movements if enemy units move in unpredictable ways. Turn 2: Move Main Echelon up 1, Spawn 2nd Echelon on HQ. End turn. Turn 3: Move Main Echelon up 1, 2nd Echelon up 1, spawn Dummy Echelon on HQ. End turn. Turn 4: 2nd Echelon moves up 1, swap all the way to the front of the conga line. 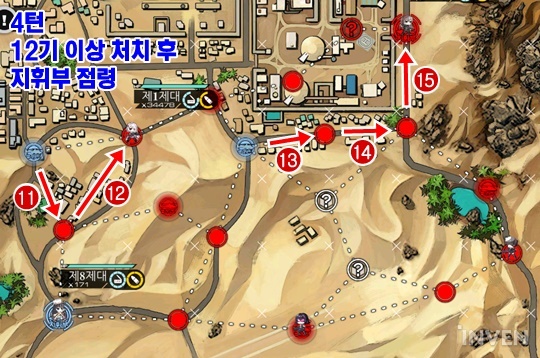 Use remaining 3 MPs to go in circle and take helipad on the right. 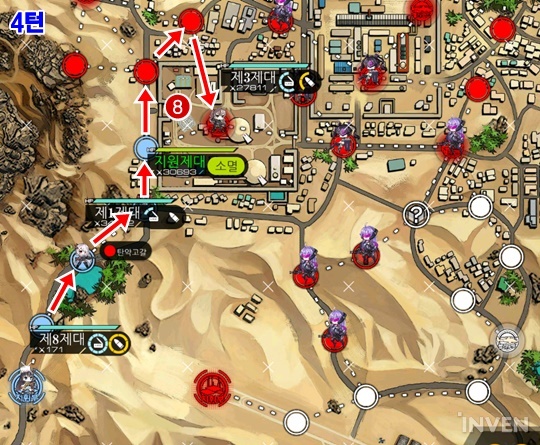 Turn 5: Main Echelon moves up one, Swap with Friend Echelon, then swap with 2nd Echelon to resupply. Then move in bigger circle shown above to take helipad on the right. 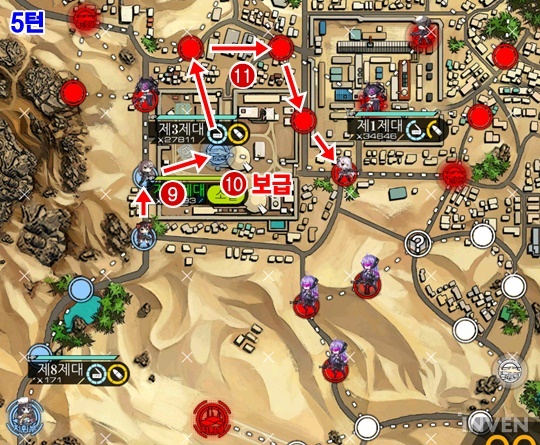 Turn 6: Main Echelon moves to take neutral helipad on bottom right. Turn 7: 2nd Echelon moves up 1 to fight one more enemy unit. Main Echelon takes enemy HQ.